We may be weak and unworthy, but the Lord calls always irrespective of our status. If we answer His call and invitation, and also trust in His power to transform us, we will be washed clean and be made to be worthy to carry out our task of proclaiming His message as Isaiah experienced in the first reading of today. Jesus came into the world and He gave His life to save the world. He chose His disciples who were to continue to propagate the Good News in His honour and glory. It is God who calls us and if we answer, He will make us worthy to become instruments of transformation in the world. Jesus has chosen us to work for Him and we must set everyother thing aside in order to answer His call. We should not be held bound by the force of doubt and unbelief, but set ourselves free by trusting in His power to set us free. The miracle that happens in our lives will always humble us and make us to realise that without God we are nothing, but with Him everything will be possible and we can achieve what we set out to achieve. 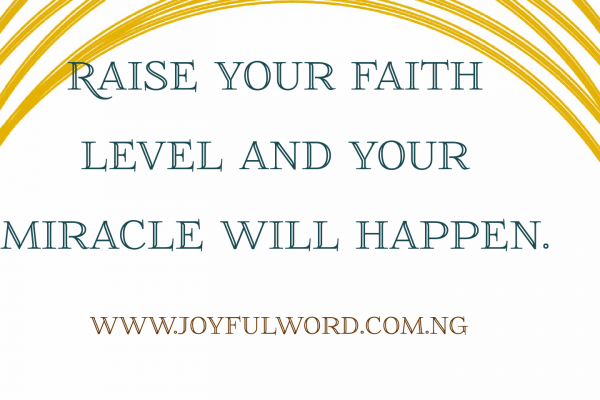 Raise your faith level and hear Jesus speak to you to let down your net for a catch even when you have tried so many times without result. We must remain hopeful when we come before the Lord because He will never fail us and whatever He does will be for our own good. Good morning dearest one. Smile ðŸ˜Šas you begin your day and do have a miraculous Sunday. May you work hard and labour with Christ so that your miracle will manifest. Amen. And May the Almighty God bless you: the Father and the Son and the Holy Spirit. Amen. *Watch-Word:* Put down into the deep and let down your nets for a catch! Miracle happens to those who have faith. Therefore, put your whole trust in the Lord and your miracle will happen.